Family therapy is a form of psychotherapy that addresses drug addiction as it impacts the whole family, rather than compartmentalizing the problem to a single individual. Family therapy views the person struggling with addiction as one “subsystem” within a unified family system. The family collectively faces the consequences of addiction and work together to overcome it. By actively involving every family member in the recovery process, family therapy promotes greater understanding and empathy between members. The approach also acknowledges the ways that addiction has affected every person involved. Notably, family therapy differs from family-involved therapy. The latter approach seeks to educate other members about substance abuse, but does not include them in treatment. Family therapy often leads to a greater chance of long-term recovery than individual therapy alone. Clients do best with a combination of family therapy, medical treatment and psychotherapy, such as cognitive behavioral therapy. 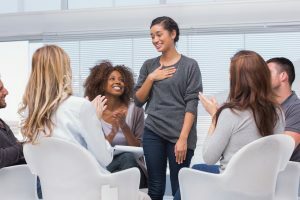 Family therapy allows each member to process how addiction has affected them, while the structure and support fosters honest communication in a way that every member feels heard. Once intuitive, the term “family” has evolved as family units become more complicated. Modern therapists define a family as a group whose members are each affected by others’ actions, and who play a long-term role in the emotional support of one another. The direct impact of one member’s behavior on the family unit is a key difference between “family” and “friends.” In the context of addiction, this long-term impact matters more than blood relation. Friends may want to help an individual who struggles with addiction, but that individual’s life decisions do not affect friends in the same way they affect family. Although all forms of family therapy share the core principles outlined above, different approaches have developed to address different family dynamics. Below are a few of the most common. A common approach when addressing substance abuse, the Bowenian method focuses on balancing the need differentiate oneself as an individual with the need to bond and develop social connection to family. This approach examines substance abuse as a reaction to anxiety, which is viewed as a family dynamic. Structural family therapy addresses the distribution of power among members of the family and dynamics that lead to family dysfunction that may lead to substance abuse. One goal of this approach when the addicted person is an adolescent or teen is to ensure that parents are working as a team to create boundaries. One of the most effective approaches to substance abuse treatment for adolescents and youth, BSFT focuses on working with parents to change the dynamics and communication patterns that permit and encourage risky behavior. As the name suggests, this approach is short-term and goal-oriented. Treatment typically lasts 12 sessions and focuses on specific ways that parents can foster an environment where drug use, unsafe sexual behavior, truancy and other harmful behaviors are less likely to occur, while building long-term healthy family dynamics in the process. As with other forms of family therapy, BSFT operates with the belief that families are are strongest when viewed as a single unit. Substance abuse and addiction affect the entire family, often leading to coping mechanisms that aren’t always healthy. Family members may become more dysfunctional as they navigate how to love and care for the addicted individual, while enduring a chaotic lifestyle at home. Children of addiction are most affected, with higher risks of mental and emotional issues. When families seek therapy as a group, particularly in response to addiction, they become a strong support system for the person in treatment. This decreases the risk of relapse and encourages the positive behaviors learned in treatment. Just as important, those who seek family therapy for addiction will have an opportunity to rebuild trust in their relationships, address and resolve frustrations and anger stemming from the struggles they’ve faced, and gain the ability to release negative emotions surrounding addiction. At Sprout Health Group, we believe that successful, long-term recovery starts with appreciation for the unique characteristics of each client, and this extends to family therapy. Our family therapy modalities, which complement medical treatment and personalized behavioral therapy for the client, are highly individualized to each family. Call us today to speak with our supportive wellness professionals about how you may benefit from family therapy.